AYO with conductor Toby Thatcher at Trackdown Studios. As part of the Art Gallery of NSW’s Resonate Series the fanfares are now ushering guests to take their seats in the old courts amongst the classic masters and they sound great! 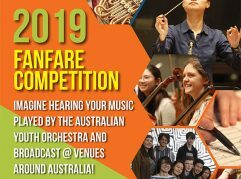 The fanfares are reaching new audiences at the Art Gallery with the recent broadcasts of Sam Weller’s Fanfare for Chaos at the Songmakers concert. 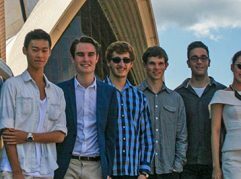 On November 20, Elise Bergman’s Sails for Sydney Harbour will be broadcast at the final concert of David Malouf with Bass Extravaganza. The double bass duo, Kees Boersma and Kirsty McCahon bring innovative programming to the sonorous music of their beautiful instrument. The duo has moved the writer David Malouf to offer them a collaboration in this concert. 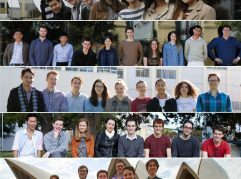 We are pleased to present the 2016-17 Fanfares recorded by the Australian Youth Orchestra. Our sound engineer Andre Shrimski has been working closely with the composers incorporating their final edits and tweaks. 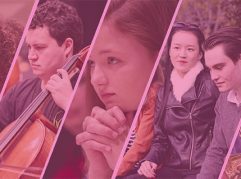 Hear the eight works by young composers aged 13-21 years, hear here. 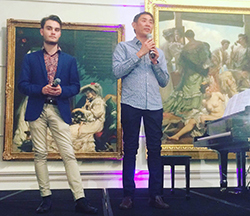 Artology is pleased to partner with ATYP’s annual foundation project. This year offering Chrysoulla Markoulli the opportunity to extend her composition skills and work with sound designer Steve Francis. The play Fight with all your might the Zombies of tonight is by award-winning playwright Matthew Whittet and is a funny and irreverent take on growing up and not becoming one of the pack. Photo: Chrysoulla working with Ella May on her song from the show. Photo by: Elise Barton. What’s on at the Red Room Company! 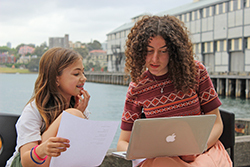 In November, the Red Room are running a series of student workshops with Sculpture by the Sea, followed by the Yala Gari Indigenous language program led by poets Lorna Munro and Eric Avery at Alexandria Park Public School. This is the first dedicated Indigenous language program to be run at the school … another great opportunity offered by the Red Room. Australian children of all ages love engaging in music and even very young children have much to gain from listening to and creating music. 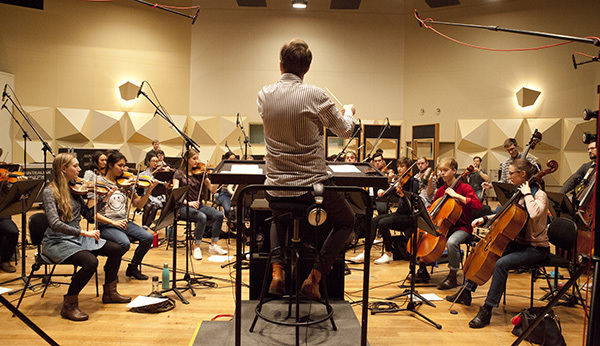 Music Australia is excited to present a special workshop to celebrate and facilitate music in the lives of young Australians. This workshop is suitable for all! Entertainer and MCUI Mentor, Jay Laga’aia, will be joined by education experts Rhonda Davidson-Irwin and Dr Anita Collins. …Find out more.